As a proof-of-principle, the scientists created 3-D deterministic microstructured security feature devices using seven materials. These included (1) a nonfluorescent photoresist (light sensitive material) to build the device backbone, (2) two photoresists containing different fluorescent quantum dots, (3) two more photoresists with different fluorescent dyes and (4) two developers. 3-D optical security features are typically manufactured through multi-step laser lithography and chemistry techniques. Microstructures for such security features usually contain a nonfluorescent 3-D cross-grid scaffold and built-in fluorescent markers realized with semiconductor quantum dots arranged onto the scaffold at will to encode a message. 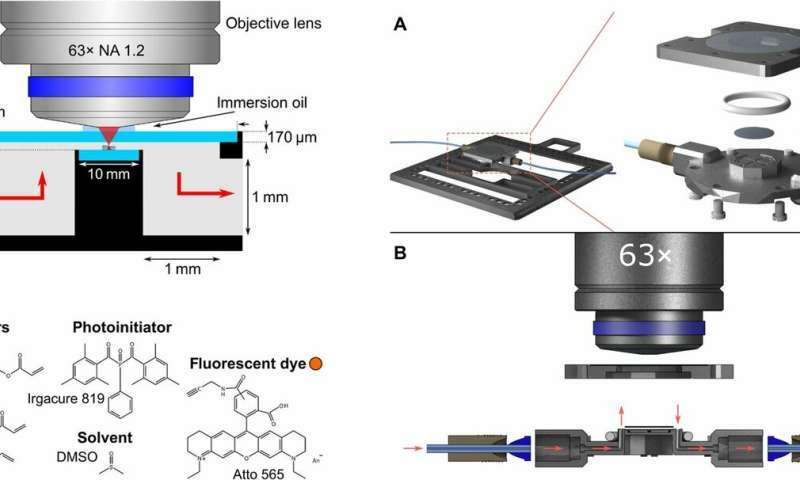 The resulting microstructure/security features can be read using optical sectioning methods such as 3-D confocal fluorescence scanning microscopy. The new system proposed by Mayer et al. therefore opens a door to engineer multimaterials in 3-D additive manufacture at the micro- and nanoscale on a combined microfluidic-lithography setup. 3-D laser printing technology or 3-D laser micro- and nano-printing emerged more than 20 years ago and is now widespread. Current applications are ubiquitous from 3-D photonic crystals to photonic wire bonds, 3-D printed free-form surfaces, micro-optics for 3-D optical circuitry and micromirrors. Applications also include optical microlens systems based on 3-D mechanical metamaterials, 3-D security features, to 3-D microscaffolds for cell culture and 3-D printed micromachines. In a majority of published microstructures, however, scientists only used one main material to create the 3-D architecture, with notable exceptions in recent literature. Scheme of the system connected to the microfluidic chamber. (A) It consists of an electronic pressure controller connected to a nitrogen bottle, up to 10 containers for the photoresists and solvents for development, and the star-shaped selection valve. Pumping individual liquids is possible by applying a pneumatic pressure to all liquid containers and opening the flow path for a single liquid using the selection valve. Following the selection valve, the liquid flow is guided through an overpressure valve and homebuilt sample holder. Last, it is directed into a waste container. (B) Cross section through the homebuilt selection valve assembly. The assembly consists of commercial solenoid valves and a homebuilt 10-to-1 manifold that connects the 10 liquid containers to 10 solenoid valves, and the valve outputs to one manifold output port. An example flow path for one liquid is indicated with red arrows. Credit: Science Advances, doi: 10.1126/sciadv.aau9160. Can all process steps be performed in the regime of laminar flow? Can an attractive system with the defined design constraints be realized on a single device? To address these questions in the new system, Mayer et al. constructed the device capabilities as a deterministic, multi-structured 3-D fluorescent security feature with multiple emission colors. The scientists used seven different liquids in the microfluidic setup as detailed onset. They constructed the microfluidic chamber and placed the structure inside a commercial 3-D laser lithography machine. The microfluidic chamber contained a small coverslip onto which structures could be 3-D printed. Structural alterations made during the experiment to the 3-D laser lithography system did not limit the possibilities of the device. Mayer et al. printed structures with a tunable printing resolution, alongside large sample footprints depending on sample size. Successive 3D printing of different photoresists. Images taken using the camera integrated into the 3D laser lithography machine. Each image shows the uppermost layer of the 3D microstructure, but after different printing steps. For the first picture, the 3D support grid and blue fluorescent markers have been printed, whereas for the last picture, markers using all four fluorescent resists have been printed. For clarity, fluorescence emission colors are overlaid. Credit: Science Advances, doi: 10.1126/sciadv.aau9160. The scientists designed the apparatus to reproducibly open and close the microfluidic chamber. To prevent pressure-induced glass rupture in the setup, they measured the critical pressure via independently controlled combustion tests. 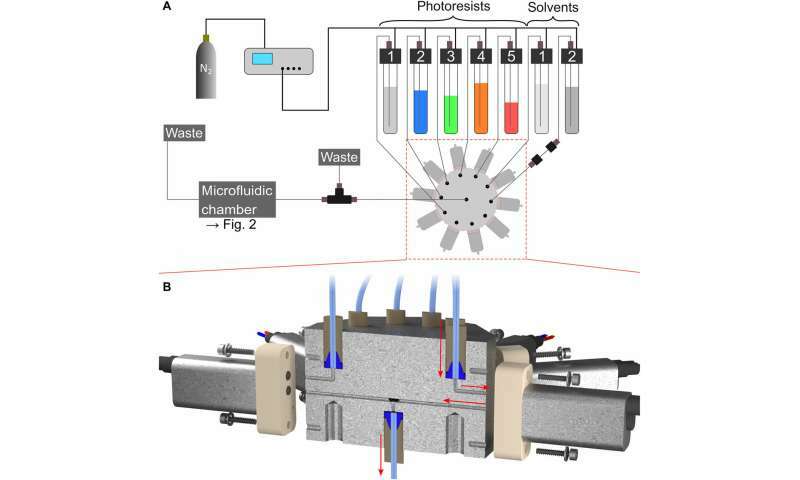 To reduce overpressure inside the microfluidic chamber, the scientists connected the output of the microfluidic chamber to the waste container using a tube. They never set the pressure controller to an overpressure exceeding 2 bar and installed a pressure relief valve between the distributor valve and the input to the chamber. In this way, Mayer et al. installed precautions to ensure the glass window remained intact under controlled flow of photoresist and liquids in the microfluidic system, throughout the experiment. The entire setup contained the microfluidic chamber, an electronic pressure controller connected to a nitrogen bottle, several reservoirs with different photoresist and developer liquids. The system also contained a homebuilt distributor valve and tubes connecting the different compartments. The scientists maintained computer-aided control of the switch valves and included a simple amplifier circuit with a microcontroller board. When deploying the microfluidic system in a 3-D lithographic setup, Mayer et al. reduced unnecessary consumption of photoresist as far as possible and augmented the device setup for optimal function, addressing both questions of the study design. The scientists demonstrated the capabilities of the system by fabricating 3-D fluorescent security features, similar to an established protocol. In the workflow, they injected nonfluorescent photoresist into the microfluidic chamber to create a 3-D support grid. Then they 3-D printed fluorescent parts of the structure by repeatedly injecting fluorescent photoresists. The blue and green-emitting photoresists contained quantum dots, and the orange and red-emitting resists contained organic Atto dyes. 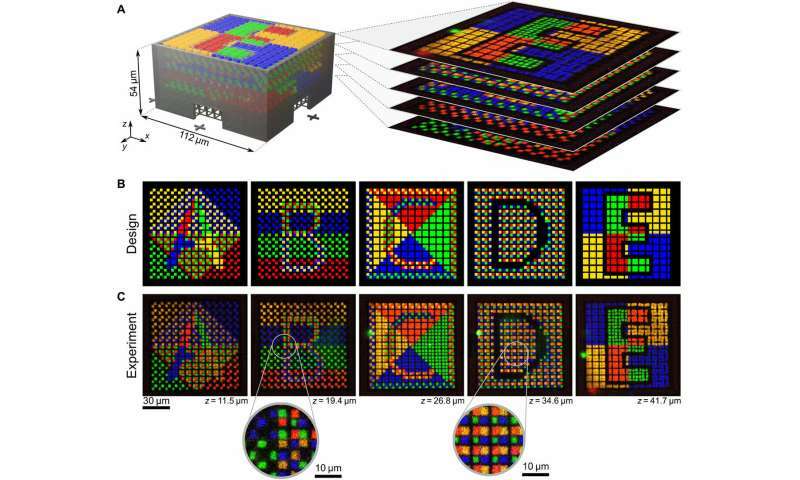 The scientists imaged the written security structure using a camera built in to the 3-D laser lithography system. Confocal laser scanning fluorescence microscopy of fabricated structures. (A) On the left-hand side, a computer rendering of the design for the microstructure is shown. It consists of a nonfluorescent 3D support structure (gray) with fluorescent markers with different emission colors printed into it. On the right-hand side, a stack of images taken by using fluorescence microscopy is shown. (B) The designs of the test patterns were printed into the five different marker layers of the microstructure. (C) Measurement data from fabricated microstructures taken using fluorescence microscopy. Insets show the level of detail at which different photoresist structure elements can be printed. Credit: Science Advances, doi: 10.1126/sciadv.aau9160. 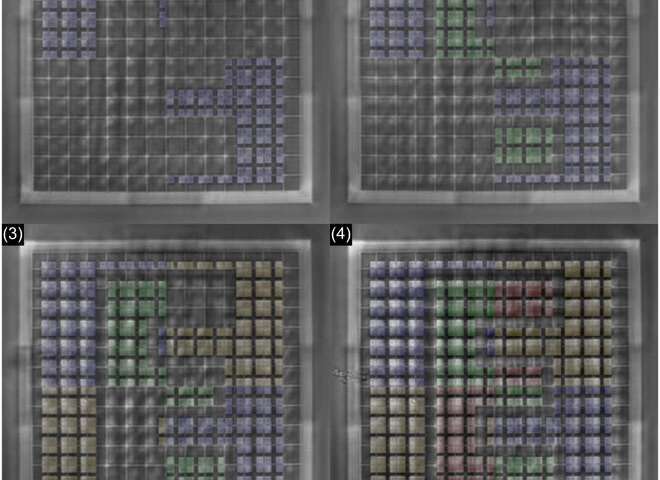 When they visualized the 3-D fluorescent security feature as a computer design, it contained a 3-D cross-grid surrounded by walls for support and fluorescent markers arranged around every grid point. The entire microstructure could store around 7.8 kbit of information. To characterize the 3-D printed structures, Mayer et al. used confocal laser scanning microscopy (LSM) and imaged the different fluorescent parts. The scientists examined the level of detail at which the fluorescent parts of the structure were printed by scanning through different levels of the fluorescent 3-D microstructure. In the work, they showed that results between the designed test patterns and measured data were in good agreement. In this way, Mayer et al. introduced a microfluidic system that could perform photoresist injection and sample development steps within a commercially available laser lithography machine. The system facilitated the fabrication of multimaterial 3-D laser lithography structures. As a proof-of-principle, they printed complex 3-D security features using the combined system in the study. The scientists envision that combined microfluidic-laser lithography systems will become widely used in the future to manufacture complex 3-D micro- and nanostructures with multiple materials. Such materials and systems will have applications in diverse fields such as 3-D scaffolds for cell culture, 3-D metamaterials, 3-D micro-optical systems and 3-D security features as shown in the study.